PHUKET: I swore last year that I would never again experience or endure another Songkran when happy, and in most cases drunken revellers, took sadistic glee in pouring buckets of bone chilling ice water over my ageing frame. More adventurous visitors can rent small hutches on the reservoir for a nominal fee. So this year my wife Natty and I decided to leave the island to them, and explore what we had been told was one of Surat Thani’s hidden treasures; that is the wonders of the Rajjaprabha Dam, formerly known as Chieo Lan Dam in the Khao Sok National Park. Geographically, the dam is approximately equidistant between Koh Samui and Phuket, taking about three hours by car to reach the parking area at the head of a massive reservoir that is used to generate electricity for the Southern provinces. I would recommend that the drive through Phang Nga and then into Surat Thani be undertaken in the early morning when the mists are still rising, the foliage is at its lushest, and the sun’s intense rays haven’t had a chance to create a blanketing humidity haze that obviates decent picture taking. Of course this being the Songkran holiday, there were scads of tourists, mainly Thai, gathering at the main parking and boat rental area. But we were early enough to snag ourselves a long tail boat driver who agreed to take us onto the reservoir for two hours for B1,500. This seemed a fair price, and turned out to be a good investment as our driver was from one of the villages that was sunken below 300 feet of water when the dam was built in 1982, and his knowledge of the bio-diversity of the land and waters of the dam made the experience notable. For those who have taken boat rides in Phang Nga Bay or Halong Bay in Vietnam, you will have a deja vu experience, as the limestone rock formations soar out of the waters with a similarly eery appearance. The reservoir is immense, covering approximately 185 sq km and holding about 5,500 million litres of water, so in our two hours we only saw a fraction of it. 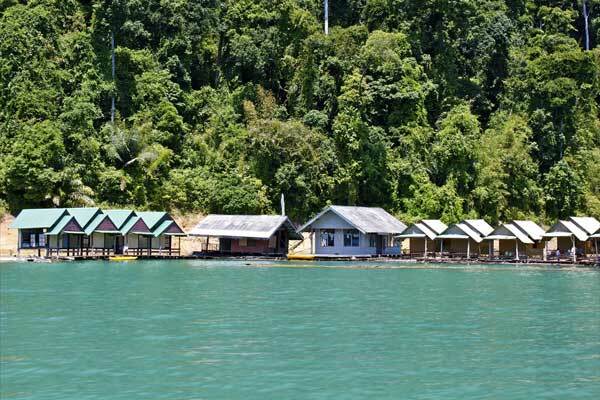 More adventurous visitors who wish to stay longer and partake in the myriad of activities on the reservoir, like scuba diving, fishing, swimming or caving, are able to rent small hutches on the reservoir for a nominal fee of B300 per person per night and then have the time to enjoy all that the dam offers. Or for the golfers, the Rajjaprabae Golf Course is a short drive from the dam, and offers a testing 18 holes over 6,000 plus yards for the incredibly low price of B600. Although our boat ride on the dam had been brief, we felt that we had learned enough to whet our appetites to come back at some time, perhaps to do a little fishing. From what we saw of the tiny rental hutches however, we knew that these were designed and built for smaller, younger, and more active people. Our guide Taweesak was most engaging, so if you are interested in visiting the Rajjaprabha Dam, it may be useful to call him to arrange any of the activities mentioned above. Taweesak can be reached at 087-021-0485 or 089-872-0953.